Frigidaire GLTF2940 Front Load Washer 3.5 Cu. Ft.
Frigidaire GLTF2940 basically has the same features as the FTF2140 - 10 cycle front loader washer, but better. With the same capacity of 3.5 cubic feet, GLTF2940 offers more wash cycles (up to 14). It is a full-size stackable washer that offers the same benefits of a typical front loader. It doesn't have a bulky agitator that helps increase the load and lower the water consumption. Although it features high-speed extraction, it is still gentle on clothes. In fact, users can very well take advantage of having four wash/rinse temperature combination, such as warm/cold, cold/cold, warm/warm, and hot/cold. Frigidaire GLTF2940 also has a manual temperature control to customize the wash cycle. It is known to clean clothes well, thanks to its two stain level selections: heavy and light soil. Through these settings, one can choose laundry items that require more wash time and longer cycles. The extra rinse as well as the extra spin options can be automatically set to allow for more thorough cleaning, as detergents that are still stuck in fabrics and not thoroughly rinsed can lead to discoloration or clothes having bad odor. But this is just the start--Frigidaire GLTF2940 also features the press saver setting for the utmost convenience of the user. This front loader comes with a stainless steel wash drum, where tumble action cleaning takes place. So even if it only has a relatively smaller capacity than other super-size front loaders, GLTF2940 can accommodate more load. The electronic controls are used for easy program settings. If the FTF2140 has an 8-hour delay start, this improved model features 12-hour delay start, so users can get back to doing other tasks while dirty clothes take a spin in the washing machine. For those looking for more options, this washing machine has three wash and five spin speed combination. They will also benefit from the advanced rinse technology that comes from having automatic bleach, fabric softener, and detergent dispensers. For streamline efficiency, it is powered with automatic temp control. The water level is automatically set based on the load and preferred settings. Safety and convenience also ranks high in its longlist of features, as this washing machine is designed to have control locks, cycle status lights, door lock lights, and time remaining indicator, among others. All in all, Frigidaire GLTF2940 is one innovative washer that's designed with easy to use settings and controls to help care for fabrics and clothings. This also translates to granting users with more freedom on how they want to do their laundry. The best part in using GLTF2940, according to consumer reports, comes from its adjustable settings that make washing clothes faster and easier. Aside from cleaning clothes well, it is also energy efficient. Despite its size, Frigidaire GLTF2940 still accommodates decent amount of load and works quietly, making it a good working companion at home. For many people, the washer is best used in cleaning athletic clothes, bedding, everyday wear, towels, and other delicate fabrics. Frigidaire GLTF2940 is also heavy-duty. 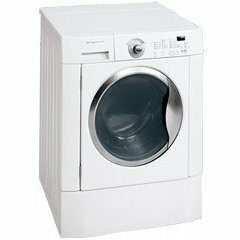 Some may even be glad to recommend it for people who are looking for a compact but still powerful washer. Frigidaire GLTF2940 is a known shaker or mover, based on consumer feedback. Some users also cited its control location as one of its disadvantages. Shorter people may have trouble reaching for those dryer buttons or controls. Its rubber seal gets moldy after some time. On top of these, some owners also complained about its defective door lock that made it difficult for them to put in the laundry items and pull out washed clothes. This washer is definitely an upgrade of other former models of Frigidaire. Though there are a few quirks, it still does a good job at cleaning and giving users a good variety of options for the wash and rinse cycles. The many benefits still outweigh the drawbacks. Comments for Frigidaire GLTF2940 Front Load Washer 3.5 Cu. Ft.
Bought the GLTF2940FSI from Sears 9/20/2008 for $ 758.57. 4.3 years from date of purchase, this washer sits in the back of my truck en route to the metal recycler. Worse machine ever. Black Mold grows on the door gasket like grass in the spring. A new gasket costs $ 150.00 and requires a service call to replace. In six months, the gasket is again black with mold. The manufacturer is of no help. I understand no manufacturer will guarantee a mold free front loader gasket and for this reason, I recommend you DO NOT BUY A FRONT LOADING WASHER. The water pump, always loud, has roared like a wounded buffalo the last six months and finally quit. The circuit board failed. I had to unplug and re-plug before it would run a cycle. American made appliance used to last 15 to 20 years. These pieces of crap are lucky to last five years. I am also so disappointed in this machine. Ours eats zippers off of stuff, clothes get caught and torn. Have had it fixed 3 times and now it is not draining the water out. I sure wish I'd kept my old washer. I will never again get a front load washer. I hate it so much I want to use it as target practice. From the mold, the broken door handle, the shaking and finally the computer panel, we gave up. It was always a problem in the five or six years we had it. Affordable but very risky. This was the most disappointing purchase ever made. The front face of the control panel crumbled within a month on the washer and dryer. It was replaced 2 times, and then they said it was cosmetic and would not replace it. The door locking was so annoying when you are in a hurry and need something out of the washer. Also, the gunk stored in the front was disgusting, and when taken apart we found $14 in change in the hose, and a sock in the motor. We purchased this washer approximately 3 1/2 years ago. From the very first month we had problems. First the mold grew. I never in my life even imagined washing my washing machine every week. And having to keep the door open when it was not in use so the mold would not grow. The repairman replaced the rubber seal (it was recalled). Then the door wouldn't lock, not just once but three times we had to have it fixed. Then the machine just stopped working, two times. Frigidaire said they would pay for the parts the last time it broke and that if it broke again they would replace it. Guess what? It broke again and they said they would only give us 40% of the cost of the machine. What a joke! I would never buy another Frigidaire anything, EVER! We are very dissatisfied customers with the machine and with Frigidaire. Just took delivery on this washer along with the matching dryer. The 1st day of use the washer stopped on the 3rd load of laundry. DO NOT buy this product. We purchased it because it was rated so highly by Consumer Reports ... they sure missed it this time. This is a piece of CRAP. Please do yourself some heartache and buy a different washer.